By Chris Williams: The Vasyl Lomachenko vs. Jose Bedraza unification fight is now officially set for December 8 at Madison Square Garden in New York, according to Ring Magazine. Lomachenko (11-1, 9 KOs) will have his World Boxing Association lightweight title on the line against WBO 135 pound champion Pedraza (25-1, 12 KOs) in this unification fight. Lomachenko and Pedraza was originally planned for a week earlier on December 1, but Top Rank Boxing opted to move it forward one week to December 8 so that it could take place on the same date as the college football Heisman trophy ceremony. Pedraza, 29, put himself in position for the unification fight against WBA belt holder Lomachenko, 30, after defeating World Boxing Organization lightweight champion Raymundo Beltran by a lopsided 12 round unanimous decision on August 25 in Glendale, California. Beltran and Lomachenko are both promoted by Top Rank, as is Pedraza. With Pedraza completely outclassing Beltran, the WBO 135 title passed from one Top Rank fighter to another. If Pedraza loses his WBO belt to Lomachenko, as many expect him to, the WBO belt will stay with Top Rank. Lomachenko is considered a lock to defeat the Puerto Rican Pedraza. Both guys have a lot of boxing skills, but Lomachenko is considered a couple notches above Pedraza in talent. If Pedraza had more punching power, he would at least have a puncher’s chance of beating Lomachenko. The only fighter in the lightweight division right now that is viewed as having a shot at defeating Lomachenko is World Boxing Council lightweight champion Mikey Garcia. However, Garcia is planning on moving up to welterweight to challenge IBF 147 pound champion Errol Spence Jr. in either late 2018 or sometime in 2019. It’s unclear whether Garcia will ever face Lomachenko or not. “New lightweight champion Jose Pedraza has the style to give Lomachenko a hell of a lot of trouble,” Bob Arum of Top Rank said about Pedraza on social media. Arum is doing what promoters do in trying to hype his fight between his Top Rank lightweights Lomachenko and Pedraza. The reality is, Pedraza is a step down in talent from Lomachenko’s last opponent Jorge Linares, who was stopped in the 10th round by the 2-time Olympic gold medalist Vasyl last May. 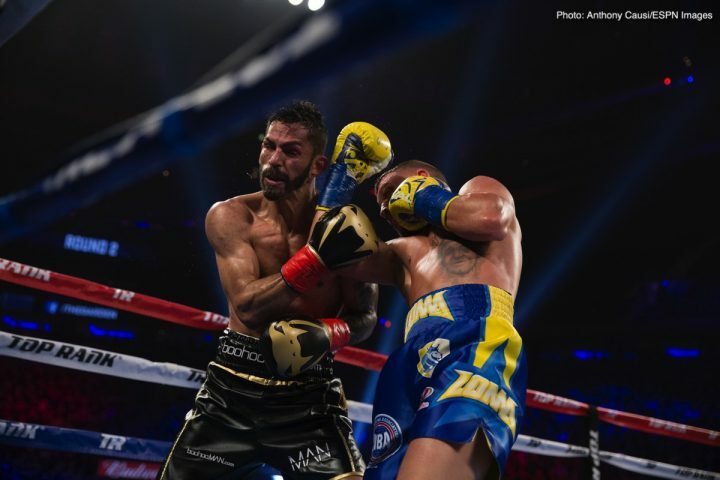 Linares was able to knock Lomachenko down in round 6 when he made the mistake of walking straight into his power zone. Pedraza was knocked out in the 7th round by Gervonta Davis last year in January 2017 in Brooklyn, New York. The fight was a mismatch from the very start with Davis using his speed and punching power to dominate Pedraza. Lomachenko will likely stop Pedraza as well, but not in the same flashy way as Davis did. Lomachenko doesn’t possess the same speed, power or mobility as Davis. Lomachenko is highly skilled, and he’ll be looking to beat Pedraza with his high volume punching like he always does in his fights. Lomachenko vs. Pedraza is a somewhat interesting fight, but it’s not the one that the boxing fans want to see. Pedraza has already been exposed by Davis. There’s not much more than Lomachenko can do to outdo what was already done before to Pedraza. Beating Pedraza won’t be a big deal for Lomachenko. People want to see Lomachenko fight Mikey Garcia. If the only thing that Lomachenko can look forward are fights against guys like Pedraza, Luke Campbell, Yvan Mendy or Richard Commey, then his popularity will bottom out. Lomachenko needs to move up to 140 to face guys like Jose Ramirez, Regis Prograis and Alex Saucedo. Now that Mikey is planning on moving up to 147, Lomachenko has no one to fight. It’s likely that Lomachenko will move up in weight soon to go after the top 140 pound fighters, because he’s going to waste his career if he remains at lightweight for long. Manny Pacquiao is clearly the biggest option out there for Lomachenko, but that fight is going to have to take place soon for it to be worth anything. Pacquiao is about to turn 40. Lomachenko needs to fight him soon before he walks away from the sport.